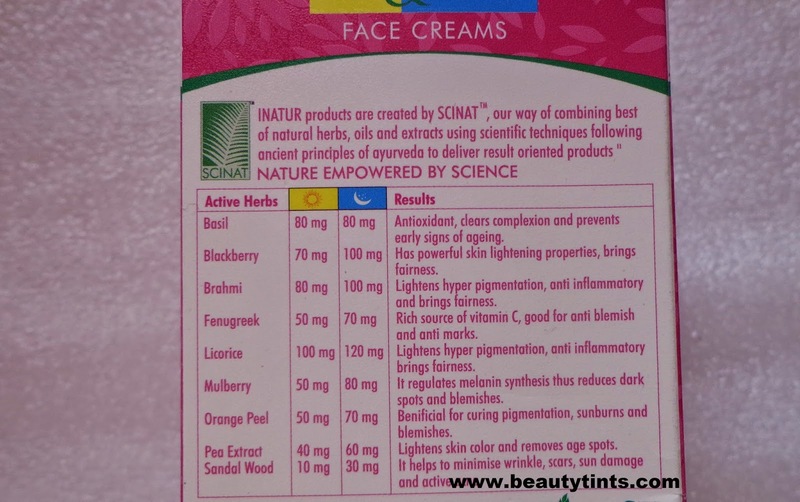 Sriz Beauty Blog: Inatur Herbals Fairness Therapy Review! 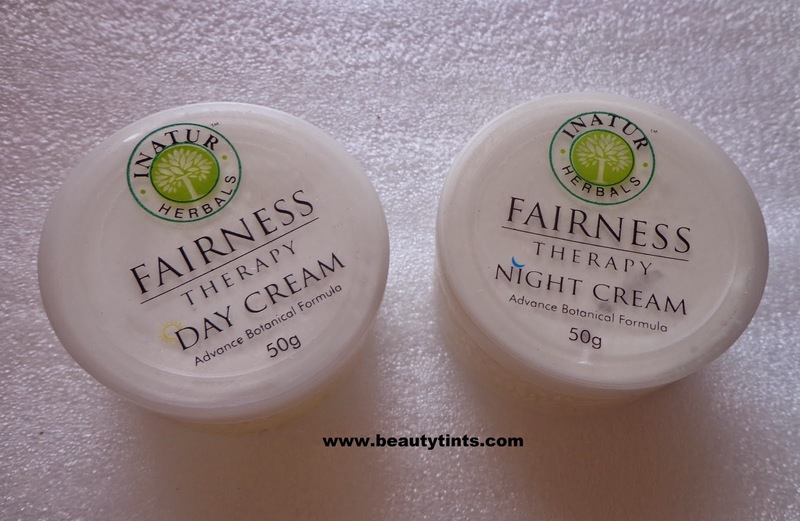 Today I am reviewing the Inatur Herbals Fairness Therapy,which comes with a day cream and a night cream.I have been using this from almost a month for now and this is one of the products from the set of products I have shown here. Packaging : Both creams come in cute and attractive little jars with transparent screw caps with labels with in a colorful outer carton. 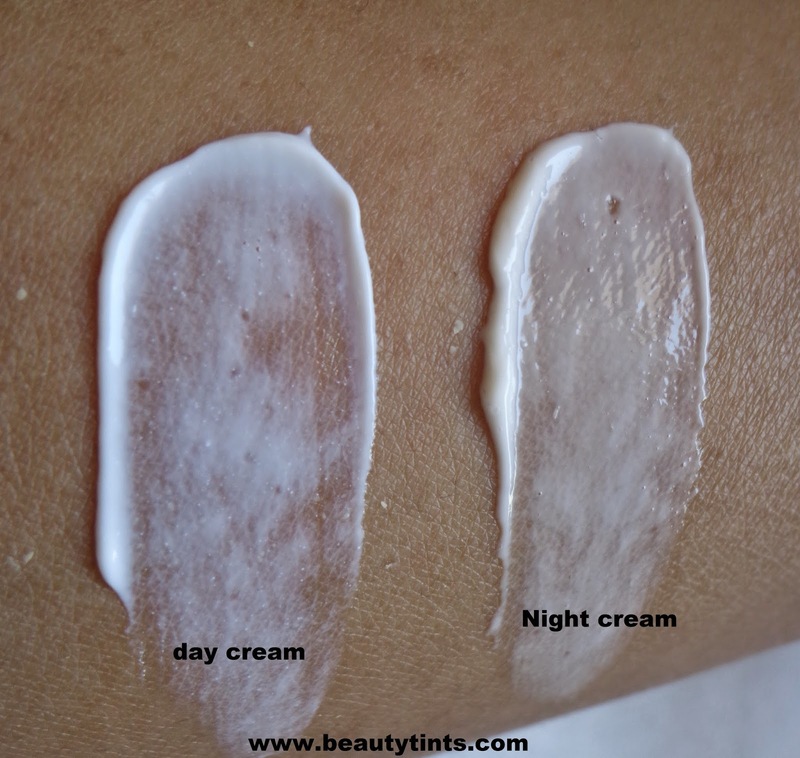 Color and Texture : Day cream is a light white colored cream whereas night cream is a bit thick in consistency and is pale white in color. An innovative fairness therapy that works round the clock to bring fairness to your skin and ensures healthier complexion. 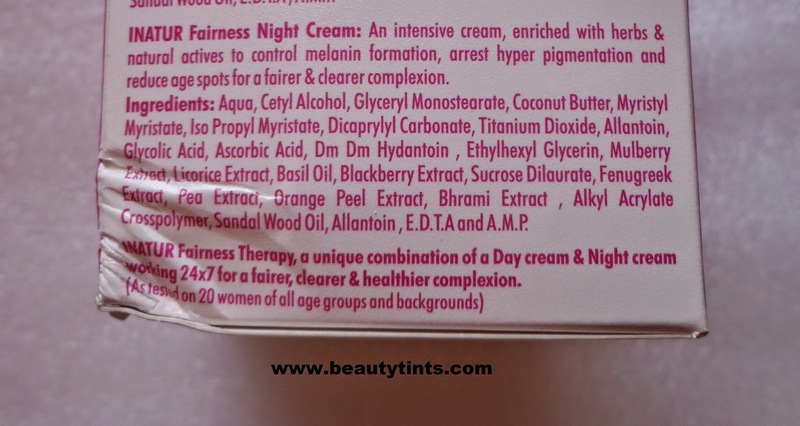 Fairness day cream is a unique formula that has 100% plant derived actives to prevent melanin formation. It has a unique combination of UVA/UVB absorbers that protect from skin melanogenesis and pigmentation. Regular usage of this product for 7 days makes skin fairer and complexion lighter. 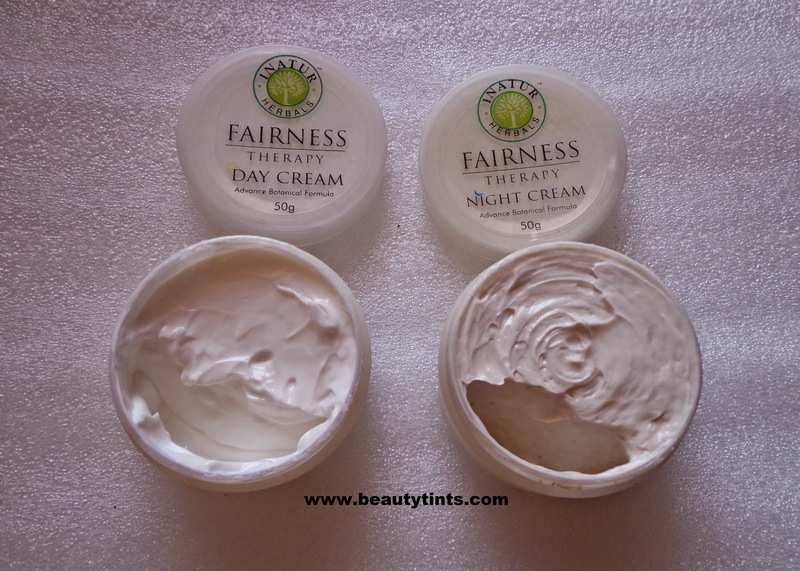 Fairness night cream is an intensive cream, enriched with herbs and natural actives to control melanin formation, arrests hyper pigmentation and reduces age spots for a fairer and clearer complexion. Directions : Take the product on the finger tips from the jar & divide evenly on face.Gently spread the cream on face in upward & outward motion along with small circular movements.Use every morning & night after cleansing the face. 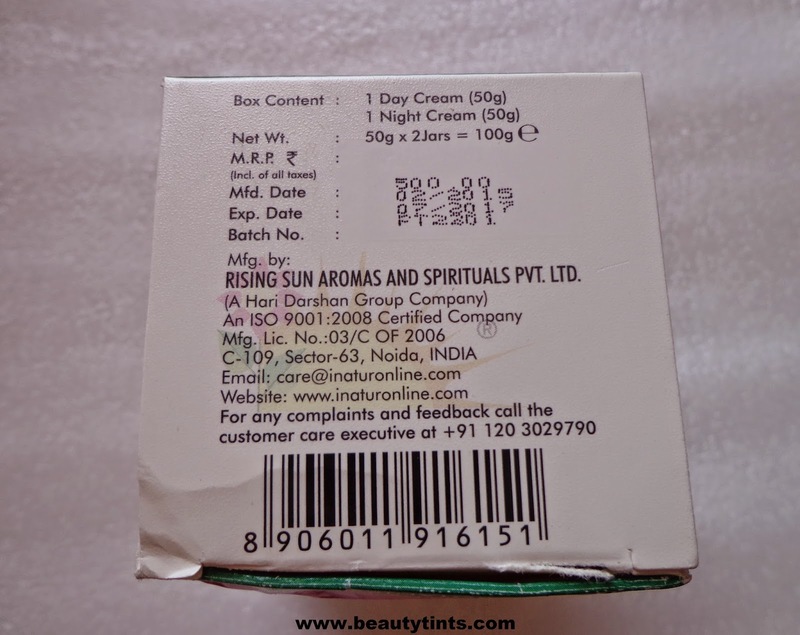 Ingredients :It is filled with the goodness of Basil- that helps in skin conditioning and brings glow, Fenugreek- which is a rich source of Vitamin C and good as an anti-blemish and anti-marks, Blackberry- has powerful skin lightening properties and brings fairness, Liquorice- that lightens hyper pigmentation, is anti-inflammatory and brings fairness, Brahmi- an anti-oxidant that retards ageing, Mulberry- regulates melanin synthesis thus reducing dark spots and blemishes, Orange Peel- beneficial for curing pigmentation and sunburns, Pea extracts- lightens skin color and removes age spots, Sandalwood- helps to minimize wrinkles, scars, active acne and sun damage. 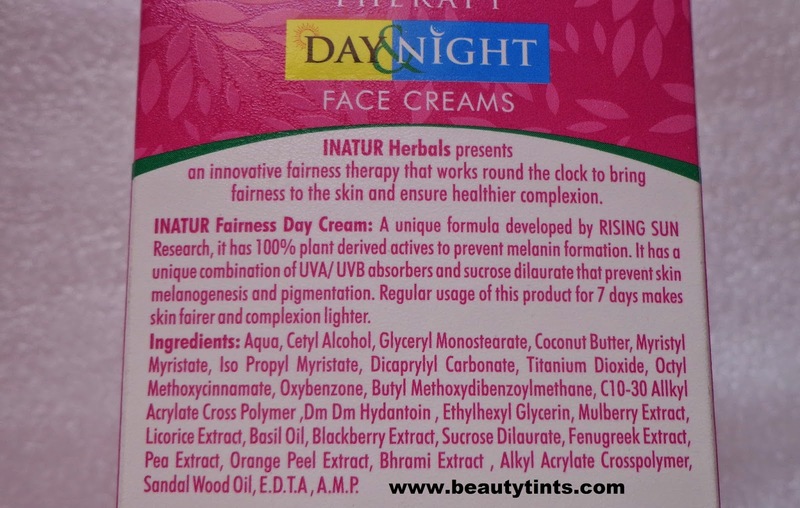 Day Cream : This cream is very light in texture and spreads as well as gets absorbed super quickly into skin.It suits combination -dry skin well,Oily skin may feel it a bit oily during summers.It hydrates the skin well and acts as a nice base for make up.On regular use,it helps in evening out of skin and as a result the skin appears clean and fair.It is made from 100% plant derived actives to prevent melanin formation.It did not break me out and it suits sensitive skin too.This cream comes with a natural UVA/UVB absorbers. Night Cream : This night cream is a bit thick in consistency when compared to the day cream and it needs to massaged well to get completely absorbed. It is one of the best night creams I have used so far.I apply this to my cleansed face and neck every night before going to bed.It makes my skin bright and radiant the next morning.Though it is a bit heavy cream,it does not feel heavy on the face. Both these creams are targeted at arresting the hyper-pigmentation ad controlling Melanin formation,which further helps in making the skin fairer and lighter on continuous usage.I have a good improvement in my skin texture as both these helped in making it soft and supple.I do have mild hyper-pigmentation on my cheeks from quite some time and these creams work very efficiently in lightening it. 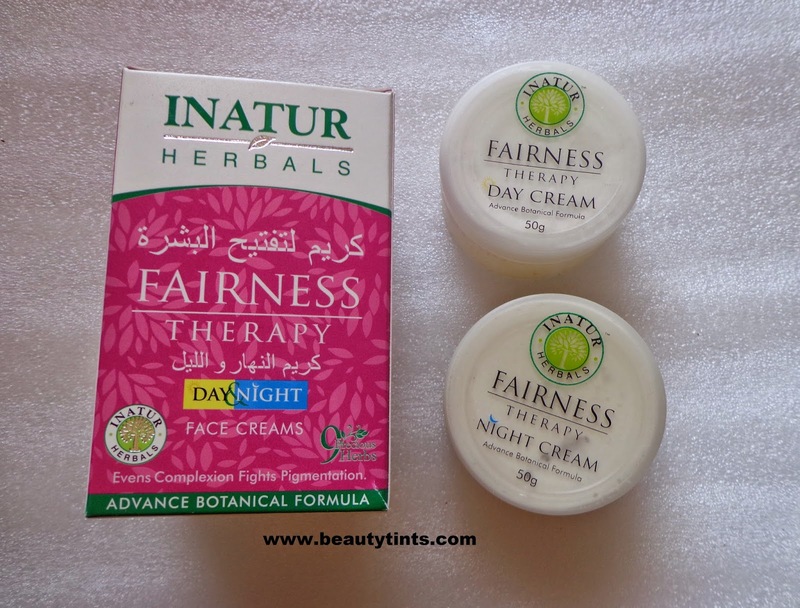 Final Conclusion about Inatur Herbals Fairness Therapy : Those who are looking for a complete solution for lightening the skin can go for this,as both these creams are made exclusively from plant derivatives as well as these are quite affordable for the result they give. 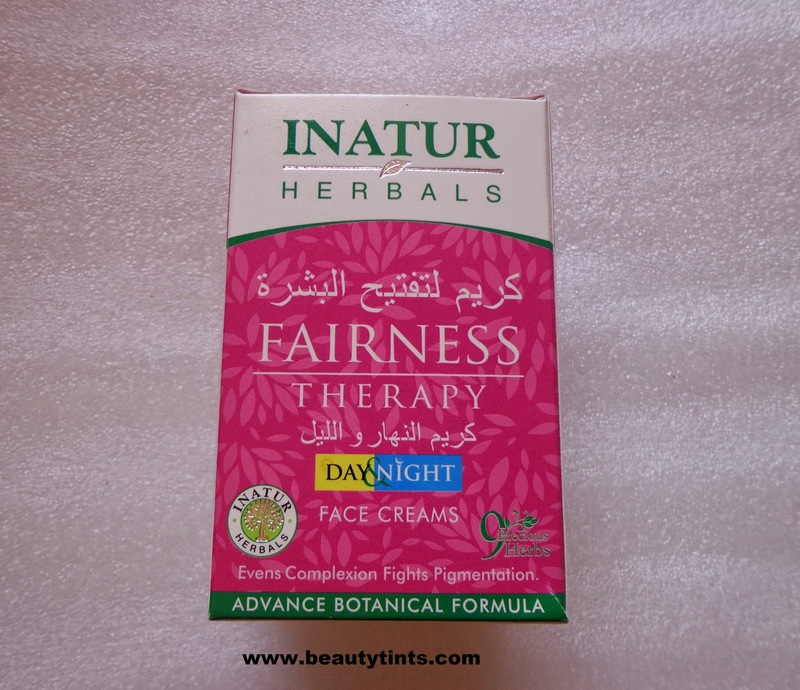 Also check out the review of Inatur Herbals Sandal Face Pack. 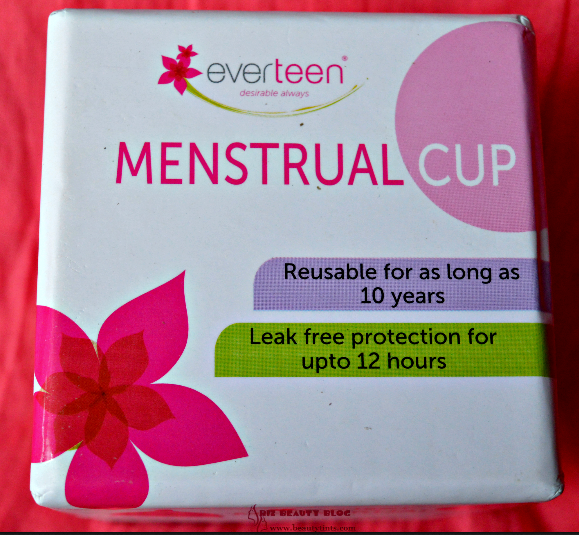 Have you participated in the Blogversary Giveaway yet? 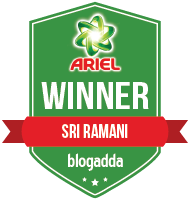 If not Participate here.